Pressing the keys R, T, Y and U. Now that you have practiced pressing the keys G and H we will introduce four new keys: R, T, Y and U. As you have deduced, these new keys should be pressed also using index fingers. 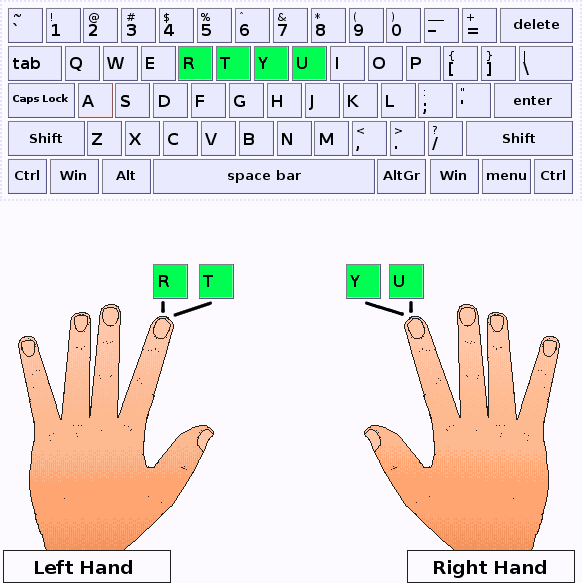 As it was explained on the previous lesson, for pressing the new keys you will have to move the proper index finger, and after releasing the key, your finger should return to the original baseline position. At the beginning you probably will notice that pressing T and Y is more difficult than pressing R and U. Anyway, at the end, it's only question of how much you practice.